Call us now to sell your home in a matter of days. No costly repairs. No realtor fees or closing costs. We Buy Houses in Chicago! You'll Get A Fair Offer! If You Want A Quick Sell For Your Property, We Have The Cash To Buy Your House Now! 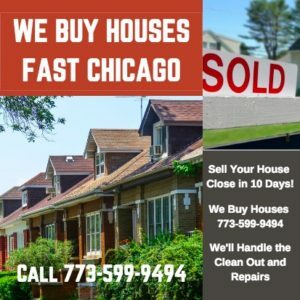 We Buy Houses Chicago and all surrounding areas in Illinois. Do you need to sell your house fast? 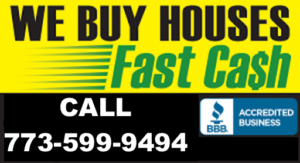 We will give you a cash offer so you can sell your home fast without a realtor, with reliable homebuyers, at a fair Price! If you’re ready to sell, we buy houses in as little as 7 days and the condition of your home does not matter. That’s right, we’ll buy your house as is so you don’t have to paint, clean, or do expensive repairs. So, if you’ve been saying, “I need to sell my house fast in Chicago,” call us at 773-599-9494 now. Are you thinking, “How can I sell my home fast” or “Who buys houses cash in Chicago?” We’ll buy your home even if you need to sell to avoid foreclosure or due to a divorce. You can also sell us your vacant house if it needs repairs, has liens, or if you’re relocating. Sell your home even if you’re behind on payments, owe property taxes, or have bad tenants. In fact, if you need to sell a house you inherited, has been fire damaged, or any other situation, we’ll buy it fast. Our company in Chicago buys houses, vacant lots, and multi-unit buildings. We also specialize in buying two flats, three flats, four flats, and warehouses. Contact us to sell townhouses, condos, or any other type property you may own. You may be thinking that only people who want to stop foreclosure need a house buying company. Actually, people need to sell a home fast for many different reasons. For over 7 years, it has been our mission to give homeowners a better way to sell. Above all, our goal is to buy houses Chicago and improve every neighborhood. We want to help! Most people who sell us their home want to move on, cash out, and sell now. Moreover, if you bought a rental property and it didn’t work out, we’ll buy it. Are you worried about the damage done to your home or needed repairs? Are repairs building faster than you can fix them? All in all, you don’t have fix or clean a thing-we’ll even clean everything out! Sell us your house As-Is! Selling your home, especially if it’s not in good condition, can be a long process. That process starts with spending thousands of dollars to get your home ready to sell. When we buy your home, there’s nothing for you to pay out of your pocket and you can be confident with our offer on your home. We have the cash to buy homes now so we can help you sell in matter days – Not months. When you sell your Chicago home to us, you get rid of all the unnecessary processes. This means there aren’t a lot of hassles involved. And since we pay cash fast, our company buys houses when people who pay with a bank loan can’t. We’ll ask about the condition and other details of your home. Then give you an estimated offer with a phone call. If you like our offer, we’ll move to the next step by scheduling a home visit. Our Top Home Buying Specialist will meet at your house to do a walk through and to have a look any needed repairs. Don’t worry, you don’t have to pay for any of the repairs yourself. We’ll take care of all that for you. Once we view the inside of the property, the specialist will explain and sign a sales agreement with you. It’s that simple. We’ll work on your schedule and take care of all the details for you. All you have to do is show up at the title company, sign the paperwork, and get your cash. The sale of your home is complete in a matter of hours. Because we buy houses for cash fast, homeowners who don’t want to do repairs can sell in as little as a week. It does not matter how unattractive or untidy the property is – we’ll buy your home fast. We are investors who have bought homes with a good history of customer satisfaction. See what homeowners in Chicago IL who have sold a home to us are saying by taking a look at our Reviews. Contact Us Today for All Your Chicago Real Estate Needs at (773) 599-9494!